[ARCHIVE] neoBrainformation • View topic - woah! How did you manage to post that big pic?!! Lovely animals though. 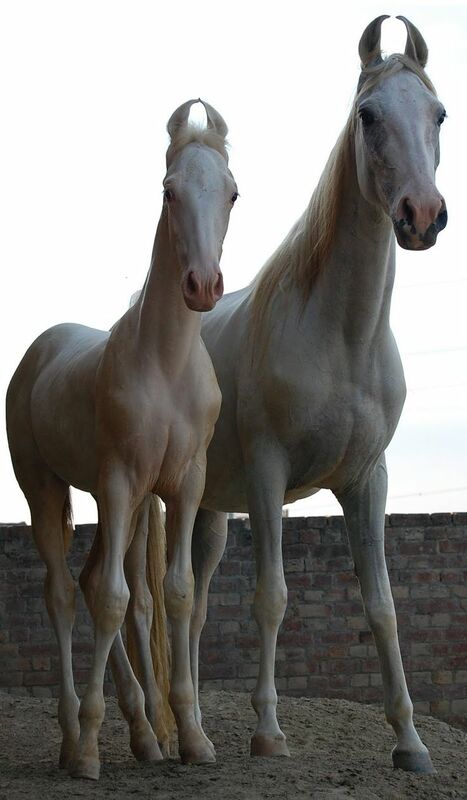 They look like Marwari horses, with their in-turned ears, but they could be Arabs, I'm not sure. Certain breeds end up like that, but they're usually tall ones. The Marwari horse today is descended from the splendid war horses that served the ruling families and warriors of feudal India, throughout and from the beginning of that country's history. Their status was unparalleled, as they were declared divine and superior to all men, including those of Royal blood. Accordingly, only the Rajput families and the Kshatriyas - warrior caste were permitted to mount these exalted animals. Fantastic! I THOUGHT they were Marwari horses. You can see why they gained such status can't you? I don't think their ears make them look regal. They look peculiar because we're not used to seeing them like that, but the animals themselves're majestic; tall strong horses with slender legs which show their breeding.